SpectraSensors’ experience in natural gas industry coupled with an impressive staff of scientists and engineers…allows the company to bring truly groundbreaking solutions to the natural gas industry. 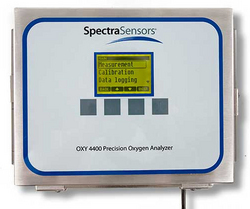 SpectraSensors, Inc., a leading supplier of optical sensors for petrochemical applications, announced the model OXY4400 oxygen analyzer for natural gas pipelines. A common problem associated with the production of natural gas is the presence of oxygen which can enter via air leaks in upstream equipment. The negative impacts of oxygen in natural gas include corrosion of piping, reduced life of gas plant equipment and penalties on the prices of the gas. Operators control oxygen in natural gas by eliminating leaks, however levels of 10 to 100 ppmv (parts per million by volume) are common. The measurement of oxygen at these low concentrations has been difficult in the past because available technologies suffer damage from corrosive constituents in the gas such as H2S and the sensors themselves decay over time. The maintenance and repair of equipment in these applications is expensive. Natural gas production and gathering sites are typically found in remote locations where technicians are not available most of the time. A dedicated trip to repair a sensor is expensive. The OXY4400 uses an optical technique called Fluorescence Quenching. A fiber optic probe senses oxygen in the gas but is immune to sulfur-containing species such as H2S which would render most sensors useless. The result is a reliable analyzer with a much lower operating cost. SpectraSensors, Inc. is a leading manufacturer of optically based gas and moisture analyzers for analytical process markets. SpectraSensors uses optical technologies such as Tunable Diode Laser (TDL) Absorption Spectroscopy in an array of products such as Ambient Air Monitoring, Moisture Analyzers (Hygrometers) and Gas Analyzers for Natural Gas Pipelines and Processors, Petrochemical Refineries and Chemical Companies. SpectraSensors’ gas analyzers measure moisture (H2O), carbon dioxide (CO2), hydrogen sulfide (H2S), oxygen (O2), and more.